Lunch break at Cal Poly. 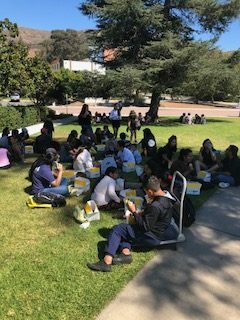 On September 23, both parents and their kids went on a field trip to California Polytechnic State University, or Cal Poly. Thank you to our Alpha Learning Center funder Association for Continuing Education (ACE) for making our first annual family university field trip happen! ¡Gracias a nuestra Financiador del el Centro de Padres Association for Continuing Education (ACE) por hacer nuestra primera paseo de familia anual a una universidad posible! Group shot on Cal Poly campus. Check out the Video of parents at Cal Poly.